Old-style garage car wash equipment. Homepage. This page: The type of car wash equipment you might have encountered in 1940s, 1950s & 1970s garages. Car washing equipment in the 1940s and 1950s. Small backstreet and "bomb site" garages operating in the years after WW2 may have "made do" with a bucket and sponge to clean their cars. Larger concerns though, or those hoping for repeat business, would have had to invest in quality equipment if their business was to prosper, or even survive, during the difficult years after WW2, when finances were tight and competition between rival garages was intense. No matter how good a job the mechanics may do on a car, the customer won't appreciate their automobile being returned to them covered in oily fingerprints. And even if the car goes into a garage covered in grime, going the extra mile - perhaps by checking the fluid levels, or giving the car a courtesy wash and polish - will go a long way in endearing a garage to a customer, who - likely as not - will recommend the garage to their acquaintances. In the 1940s and 1950s there were far more garages than there are today. Every town would have numerous businesses, large and small, vying for their slice of the local maintenance market, and offering car washes was just one of several attractive services they may have chosen to provide. This page features some of the car washing equipment that one would likely have encountered in establishments up and down the land, all designed to transform the muckiest of motor, into a car to be proud of. Examples of 1940's car wash plant. Both of the vehicle washers shown above were advertised in 1948, the first is by Laycock (the "Niagara-Merlin") while the second is from Tangye (the "Aquaforce"). The former pressure washer was available with either one or two washing guns, the running gear housed within a sturdy cast casing. The gun could deliver either a jet or diffused spray, at a pressure of up to 375 psi, enough to lift the paint off any poorly-repainted car I'd imagine! 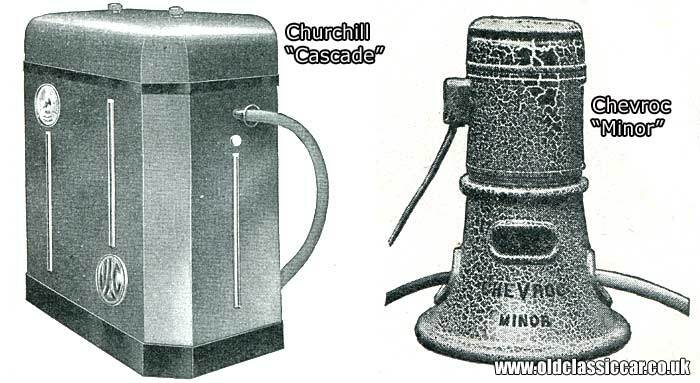 Prices for the Niagara-Merlin started at £105 for the single gun, three-phase version, rising to £129 for the washer that incorporated a DC motor. If the need to clean more than one car at a time was likely, then the twin-gun model which comes with two 25ft long delivery hoses as standard, prices starting from £154 and rising to £180, would probably be a better bet. 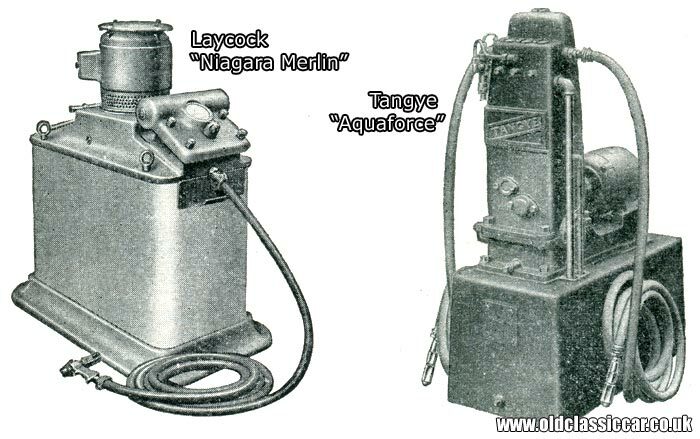 Also illustrated is the Tangye "Aquaforce", a similar product to the Laycock and also available with single or double hoses. Prices range from £87 for the belt-drive, one-gun model, through to £140 for the twin-gun, DC version. All utilise 25ft long hoses, and as with the Laycock product, deliver up to 375 psi pressure. For a garage looking to modernise its appearance and present cutting-edge equipment designed in the modern way, then perhaps the Churchill "Cascade" pressure washer was the one to go for. While the previous two examples look quite utilitarian, and decidedly pre-war, in their looks, the Churchill is altogether much sleeker (if such a thing can be said about car wash equipment...). In this instance, the pump and the motor are fully enclosed within a sleek metal cabinet, one that is easy to keep clean and that also protects the workings from the elements. The gun, or guns (depending on which version was chosen), offer infinitely-variable spray patterns and bore prices comparable to other machines on this page. Not every business needs large-scale washing facilities, and for those that only wash cars on an infrequent basis, then smaller machines such as the Chevroc Minor shown here, or the larger Major, would suffice. The Minor was on sale for £47, while the larger Major model had a list price of £60 and £79, depending on the available power supply. Top of the range was the Chevroc Rex, for which £96 was asked. Garages where vehicle washing was a routine occurrence, could well find that hoses lying around the workshop floor becomes both an inconvenience and, in some cases, a danger to workers in the area. Overhead swinging arms are an excellent solution, and the 1948 catalogue offers a couple of alternative solutions. The illustration above demonstrates the arrangement of the "Simplex" overhead washer. Here the pressurised water is fed along pipework to an overhead assembly which pivots in the centre. A small, ten foot long, hose is attached to the pivoting assembly, enabling the user to move around the car with ease, washing it without the risk of tripping. The Simplex overhead washing arm cost just £8 and was surely a popular choice for any establishment that cleaned vehicles. The Laycock swing arm is a wall-mounted version of the Simplex, costing an extra fifteen shillings. In the photograph, a stately Humber from 1939 is having its underside pressure-washed. In addition to this type, Laycock also had an overhead swing arm on offer, similar in principle to the Simplex, in that water was distributed to a pivoted central overhead supply. A similar catalogue but from the early 1970s lists similar, updated, equipment, and also several examples of drive-through automatic car washes which were now becoming popular. Products from companies such as Kismet, Tecalemit, Wickham, Esquire and Emanuel are described, some of which are shown below. A Mk2 Ford Cortina enters a Wickham "Auto-Mat", while a Mk2 Triumph 2000 exits an Esquire "Autocrat". 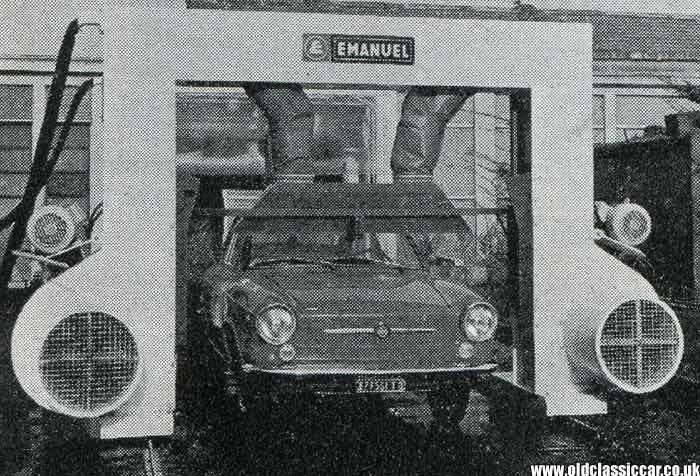 An MGC GT receives the Esquire treatment, while a Fiat demonstrates the Emanuel "Automec". A Fiat 850 Coupe benefits from a run through the Emanuel "Gemini" washing, waxing and drying plant. Return to the gadgets, tools & equipment pages at oldclassiccar.